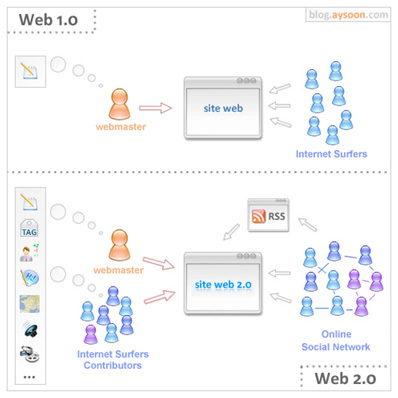 Before starting to talk about Web 2.0 tools it is important to begin with the Web 1.0 environment, especially within the context of a school community. It is imperative that a school library has, at least, a school library web page within the school web site. This page provides a context and a connection. The context is that the school library is an important contributor to the teaching and learning program within the school community. A school library web page can provide a context for the library and information services to support inquiry, discovery, knowledge creation, creativity and innovation within the school’s curriculum program. It can also be the platform to provide links to other useful virtual places and spaces. The connection is with the users of the school library. The school library web page provides a ‘base camp’ for the school community; a centralised location from where they can gain access to other information services, research tools, resources, etc. Web 1.0, in this context, provides access to information and content that is professional, authoritative and reliable. From this location the user can then explore the links knowing there is a level of ‘social responsibility’ taken by the author of the school library website. Let’s consider this graphic in a table format with some other flip-side perceptions. The information included in this table is certainly not definitive, but should give you some idea of the differences to be explored through utilising and promoting the use of Web 2.0 tools. Before embarking on the integration of Web 2.0 tools into the school library services and programs it is important to consider the purpose for adopting these tools. Consider what you are doing now and how Web 2.0 tools may make your life easier and more relevant to your users. Will these tools be able to streamline the provision of library and information services? Will these tools provide students with easier access to useable and relevant information to help them through the inquiry learning process? What could you do differently by using Web 2.0 tools? Do not get caught up in the hype and end up adopting these tools just because it is Web 2.0. The cliché, ‘work smarter and not harder’, is very relevant to the decision-making process when it comes to considering the place of Web 2.0 in an educational context. Do not add-on to an already busy existence as a teacher librarian. You need to use these tools to free up your time to think and act strategically within your school. Other considerations are providing a safe place and protecting student work as well as assessing collaborative team work in a Web 2.0 environment. The Horizon Report: 2014 K-12 Edition (2014, Johnson et. al.) is a very good place to start to look at the key trends and the emerging technologies within an educational context. This report is part of the Horizon Report series which can be viewed at NMC Horizon Report. This is an ongoing research project that identifies and describes emerging technologies that are likely to have an impact on teaching and learning within education at a global level. The focus for this ‘hot topic’ will be on an immediate to short-term rollout of emerging technologies, particularly collaborative environments. Future articles on the topic ‘how to successfully utilise and promote Web 2.0 tools’, will focus on other technology trends. Collaborative environments are virtual places where individuals, such as teachers and students, can gather to communicate, share information and work together on a given topic. These places allow group interaction and peer-to-peer exchange at a local or global level. They can be simple web-based environments such as a wiki through to virtual worlds like Second Life. A common denominator is that the facility allows multiple users to work within the environment as readers and writers; able to contribute their reflections, thoughts and ideas at any given time. Within these environments teamwork and collaborative effort can be encouraged. Guests, experts and community leaders can be invited to participate therefore providing opportunities to connect with people beyond the walls of the classroom and geographical location of the school. Shared document tools like Google Docs , PBWorks, Wikispaces allow users to work as multiple authors on a single document. These environments are suitable for the school-based user. The web site, Bright Ideas, features wikis used by teacher librarians to make connections to school library programs, e.g. information skills development and resources, and curriculum areas, e.g. English, art, theatre. It is important to take the time to see what others are doing and how they are using shared document tools. The PBWorks education page provides some background to the use of collaborative workspaces within the education context. For example, if several people need to be working on the one document/file a wiki will allow everyone to see and edit the document/file rather than relying on attachments to emails and then making sure you are actually seeing and working on the latest version. As a teacher librarian you could be working on a policy document from a whole school development perspective. If you are developing manuals and procedures for the school library management and operations you can share with other teacher librarians in the same schooling sector. If you are developing a professional learning event you could be using a spreadsheet for the program layout and have collaborative authors working towards a final copy. Also, PBWorks allows you to secure your working documents which you can provide access only to a classroom teacher or a colleague. Basically, the storage and sharing is not dependent on one individual computer and the content of its hard disc drive. You can be anywhere in the world and access and work on your documents and files. Whilst social networking tools like Facebook and MySpace have been more suited to the personal and social interaction, fully-featured tools like Ning are emerging as suitable workspaces for teacher and student collaboration and interaction. Users can embed documents, multimedia, video, images, music as well as participate in chat, forums and groups. In a school-based environment you might want to set up a Ning as a private space, rather than public, for students’ collaborative work. Classroom 2.0 is a good place to start to see how other teachers are using Nings. The Classroom 2.0 provides quick access to topics via its tags based on subjects, tools and area, e.g. acceptable use polices, assessment, online learning. At the far end of the spectrum are the 3D virtual worlds that use Teen Second Life. Peggy Sheehy, teacher librarian at Suffern Middle School, New York, USA has developed Ramapo Island . In concluding this article I will reiterate some previous points. 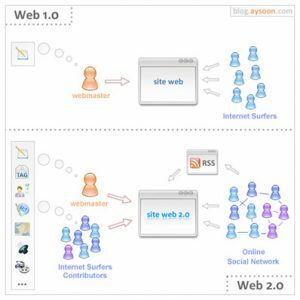 Make connections with your students and teachers through the use of Web 2.0 tools. If you can identify how these connections will benefit the planning and delivery of teaching and learning programs within the school curriculum program then you are part way towards utilising and promoting Web 2.0 tools.